This presentation will focus on the theoretical underpinnings of phenomenology and hermeneutics as they are applied to a research paradigm which aims to: provide insight into the experience of being an Australian civilian nurse within the out-of-hospital environment during a disaster. A purposive sampling technique was employed to recruit participants for this research. Subsequently, data was collected from eight participants using semi-structured interviews at two points in time, one week apart. The first interview was primarily phenomenological, whilst the second was more hermeneutic in nature. Participant narrative was captured on an electronic audio recording device and transcribed. In terms of data analysis, phenomenology is neither inductive nor deductive, rather phenomenology is reductive. This research primarily used an eidetic reduction of participant narrative, returning to the experience as it is in itself; by uncover the uniqueness or ‘whatness’ of the experience. The result of the reduction is a lived experience description, a description of the experience that is recognisable by others of what it may be like being an Australian civilian nurse within the out-of-hospital environment during a disaster. Ranse J. (2014). 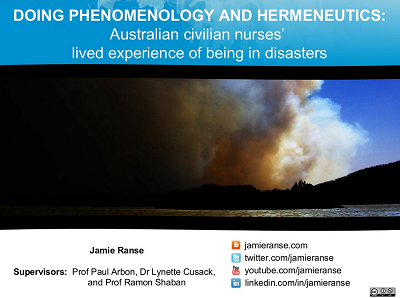 Doing phenomenology and hermeneutics: Australian civilian nurses' lived experience of being in a disasters; presentation at the Higher Degrees Week - Flinders University, Faculty of Health Sciences, School of Nursing and Midwifery. Adelaide, South Australia, 30th June.